At Kirsch®, you will find an array of products that will suit the needs of any home. 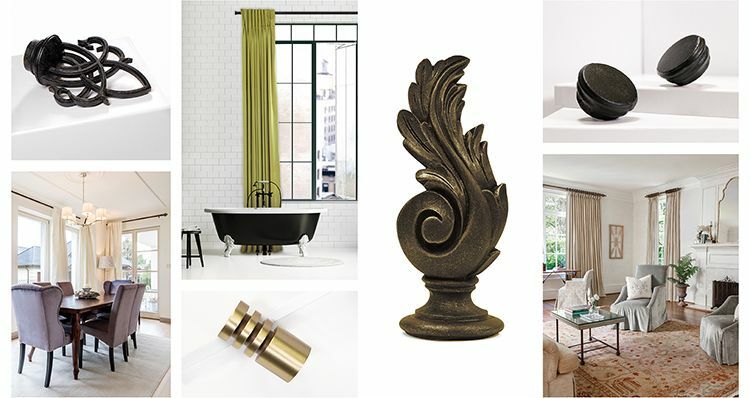 The variety of hardware pieces you will find will help you create a cohesive look throughout the home that will allow you to display your unique style. With custom drapery hardware, there isn’t a look that you can’t achieve. Our dealer network can help you create just the right look for your home by offering designer products and expertise you won’t find elsewhere. Our wide selection of drapery hardware includes finials, poles, rings and accessories, which come in a range of styles and sizes that will add the perfect touch to your windows. Don’t find yourself limited to just a certain color, material or style when designing your drapery and window treatments. Instead, work with Kirsch® to create the custom look that sets your home apart. Our team is ready to help you transform any room in your home with elegant, contemporary and traditional pieces you will love for years to come. Kirsch® carries a large inventory of drapery hardware, in various materials, enabling you to create styles that are sure to achieve your decorating and style goals. Our products can match the style of any room. Whether you’re going for a more neutral look with our Wood Trends™ collection or a timeless, traditional design with our Wrought Iron collection, you will find that all our products carry beauty and elegance. Discover the intricate designs and hand crafted details of our Buckingham® collection and the sophisticated products inspired by ages past in our Renaissance™ collection. We also offer various products in our Designer Metals® collection that can create the perfect, cohesive look for your home. Learn more about each collection and how its products can complement your home’s décor. Stay up to date on the latest from Kirsch!